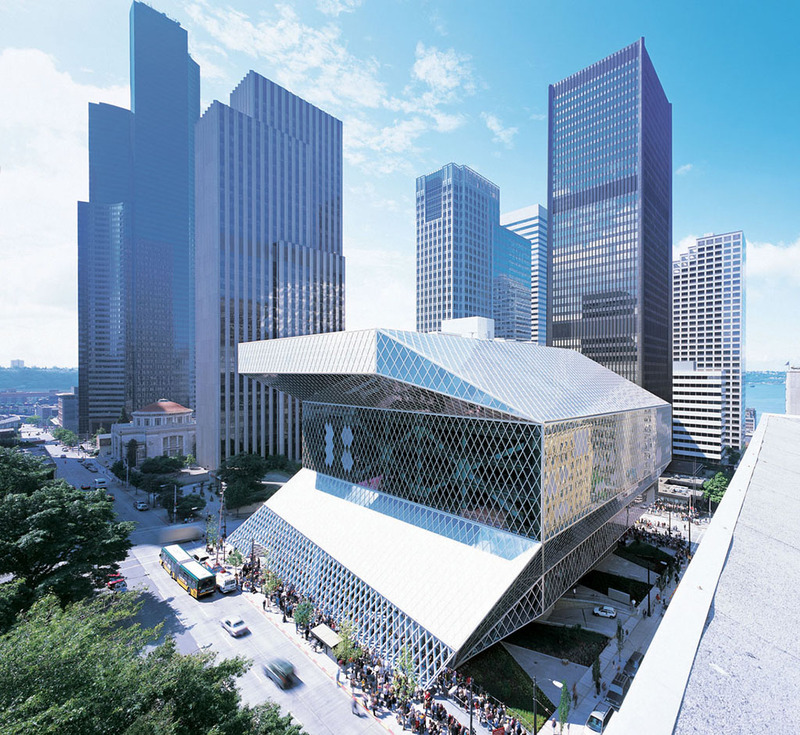 Architourism: Seattle Central Library | whitespace.
. Published on September 30, 2014 . Several weeks ago I visited Seattle for the first time. I’ve always had an affinity for cities shaped by water, and I was looking forward to seeing this particular watery city because of its commitment to civic architecture and design. As a relatively young city, Seattle has employed architecture to shape its progressive identity. Wealthy donors like Paul Allen have bankrolled new buildings, and citizens have passed bond measures to finance others. An incredible array of great public buildings and spaces have been built over the past 15 years. I was able to hit several on this trip, and still have a long list to tackle on subsequent trips. 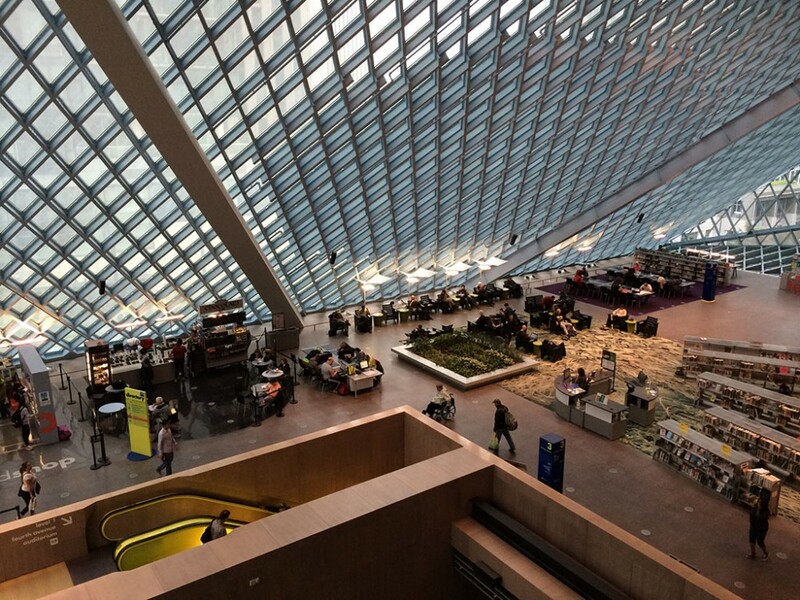 But my favorite was the Seattle Central Library, revered among architects for redefining what a library could and should be in the 21st century. The changing role of the library in society has been on my mind lately, as we see clients in several of our studio locations grappling with this issue. 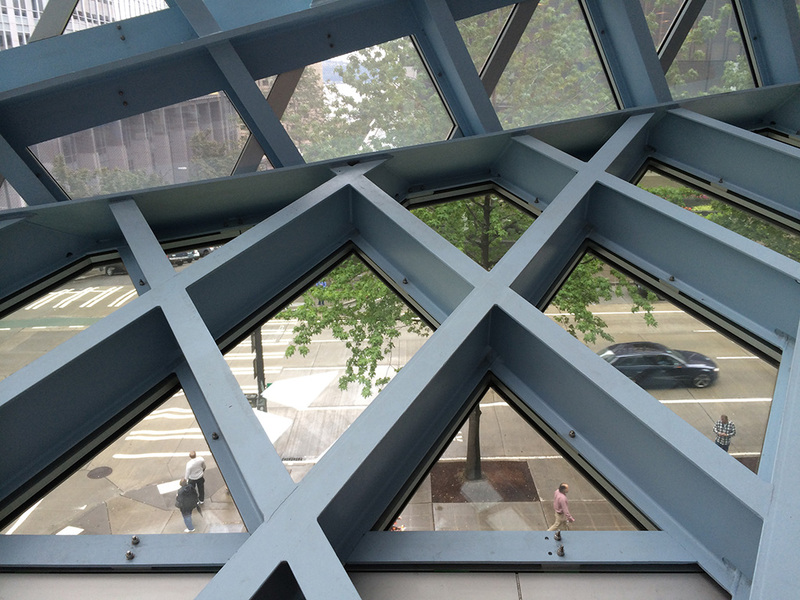 It was a typically rainy Seattle afternoon, a perfect library day. Because the building is often photographed from a heroic angle that makes it appear to dominate surrounding structures, I was surprised to see that it actually fits more smoothly into its urban environment. The building’s distinctive latticed skin with its diamond grid pattern reminded me of the surrounding office tower window grids turned on an angle. The base is at a human scale and the entry appears rather modest. This level includes a children’s’ center, a literacy/ESL/language center and book return/checkout. 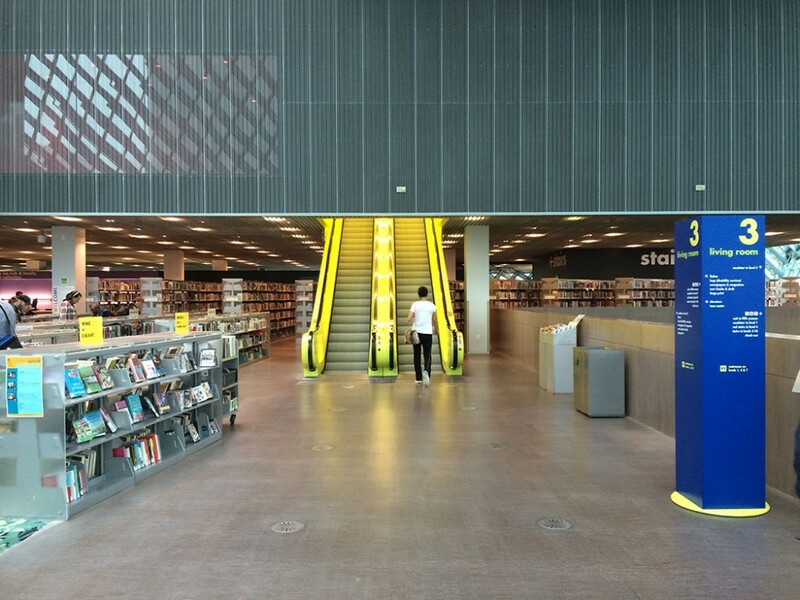 A right turn leads to the iconic glowing yellow escalators, inviting the visitor upward. The third floor living room is an incredible public space. The soaring volume with its slanted roof and glass, steel and aluminum latticed skin feels like a greenhouse and amplifies available daylight on a gloomy afternoon. People from all walks of life were seated in comfy chairs, perusing the wealth of available periodicals reading books, or checking their phones. The environment wasn’t completely hushed, but still respectfully quiet. Looking around, I could feel the architects sending a clear message that this is a building for everyone. Looking upward, the bright colors of the interior floor volumes were cheerful and invited further exploration. The fifth floor mixing chamber is where library staff has the most interaction with the public via a central circulation desk. If you need a book, a staff member can retrieve it from among almost a million others via a state-of-the-art book sorting and delivery system. 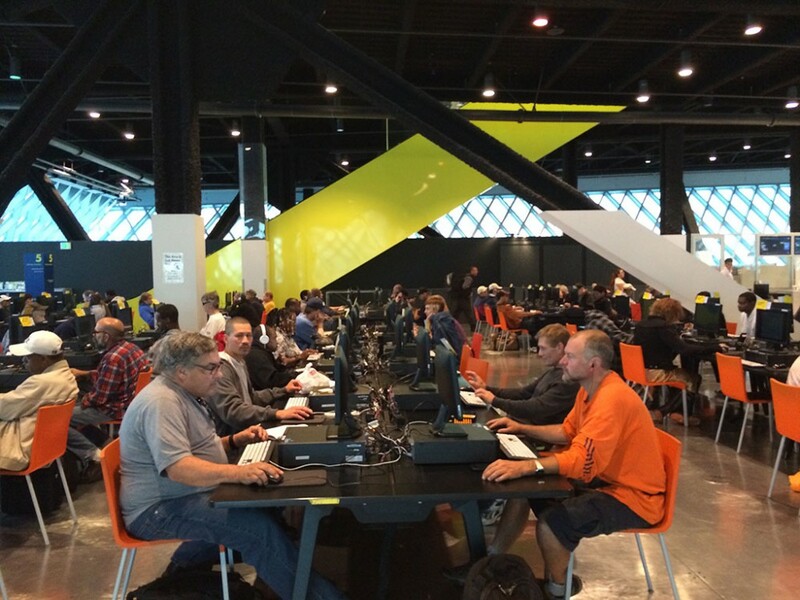 If you need help accessing digital resources, 140 computers are available to the public, or you can bring your own. Almost every seat was occupied. The edge of the chamber provides an overlook down to the living room and to the city beyond. I skipped the three repetitive book storage floors of “the book spiral” and went straight to the tenth floor reading room. Here, patrons studied at spacious desks in daylit spaces, librarians handled maps and other special collections and architectural tourists snapped pictures of the Emerald City through the latticed skin. 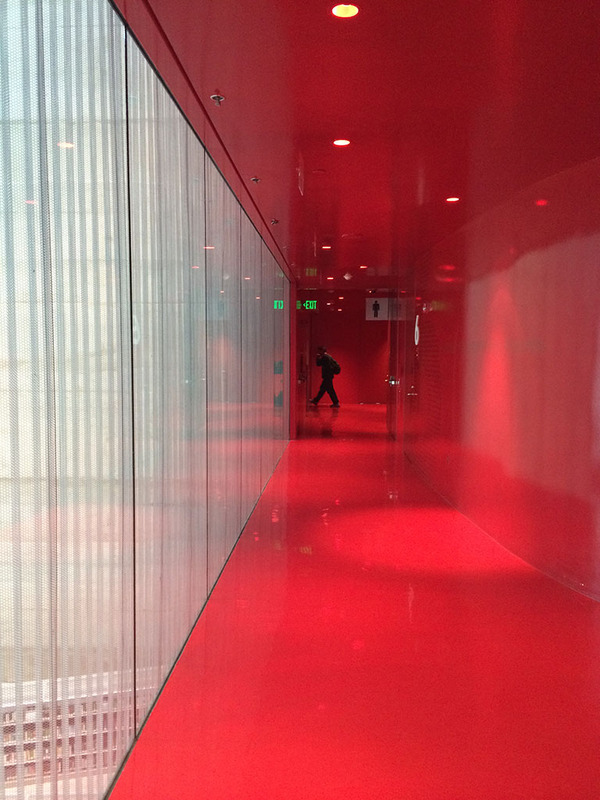 On the way down, I discovered the meeting area on the fourth floor, enclosed with organically-shaped lipstick-red walls and metal mesh. This space contrasted delightfully with the architectural language of the rest of the building and made me feel like I was in the movie 2001 Space Odyssey. I also found the auditorium for lectures and larger events, stacked compactly in the center of the building and stepping neatly down from the third to the first floor. The Seattle Central Library has the distinction of being better, more alive and interesting in person than it is in photographs or descriptions. Already 10 years old, it still appears fresh, provocative and inviting. Most importantly, it’s evident that the city has embraced it and uses it heavily, that even in the age of the smartphone and the Kindle there is a role for the library as a civic gathering space and center of knowledge. Our own Lawrence Public Library has recently opened to much public excitement, and with the similar goal of creating a community gathering space first and foremost as the library’s resources evolve. It’s exciting to see our building come alive and fill a void for the public of Lawrence, Kansas, and will be even more exciting to see how it too adapts to future change.